Probably designed originally as an altarpiece, this painting represents the mystical vision of Gregory the Great when, according to legend, Christ appeared to the saint as he celebrated the Mass. As it is the actual vision that is represented, the saint is not included. 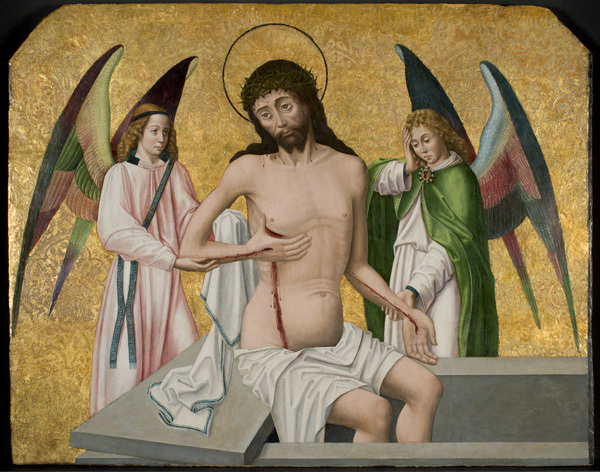 The resurrected Christ sits at the edge of the tomb supported by two angels and bearing the marks of his suffering and death on the cross: a lance wound in his side, nail holes in his hands, and a crown of thorns piercing his brow as well as marks left by the scourging that preceded his crucifixion. Such realistic representations were popular during the late middle ages as the result of widespread cults devoted to the wounds and blood of Christ. The rich gold textile seen behind the Messiah includes pomegranates in its design as a symbol of eternal life. While the work appears to have been painted in the southeastern part of France, the realistic imagery may well have been inspired by examples from northern France.